There was only one major no-show on Friday night in Las Vegas for what turned out to be — as much as it could be — a Beatles reunion. 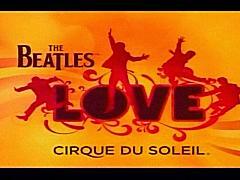 For the premiere of Cirque du Soleil's stunning new Beatles show, "Love," at the Mirage Hotel, a group of people came who have not been in the same room since — well, I don't know — came together for one night only. Who would have thunk it? 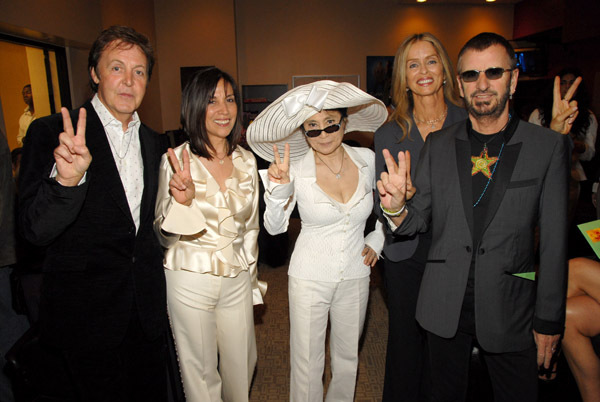 Paul McCartney, Ringo Starr and the widows of John Lennon and George Harrison — Yoko Ono and Olivia Harrison — united for a moment in time to honor the group's historic accomplishments. They are without a doubt the First Dysfunctional Family of Rock 'n' Roll. That would have been extraordinary enough, but also present for the event were John's first wife, Cynthia Lennon, their son, Julian, and Ravi Shankar, Harrison's great musical influence and friend. For a time after the show was over, this entire gang — as well as Apple Records' masterminds Neil Aspinall and Jonathan Clyde, plus Paul's brother-in-law/business partner John Eastman and old friend, record producer Peter Asher filled a very small space set up as a "private" party within a humongous celebration for the 4,000 people who'd come to see the first two official presentations of "Love." They laughed together, ate together and reminisced. There was much picture-taking. As on the stage when "Love" concluded to resounding thunderous applause, standing ovations and tears, McCartney actually kissed Ono. Time stopped. Hell froze over. 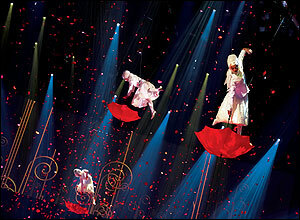 Ono, who wore a bright white suit and a matching big white floppy hat which she wore all night, kissed him back. She took pictures with Cynthia and Julian, whose financial fate she's held in her hands often. As a Beatle fan and amateur expert on the lives of these people, I thought maybe I was hallucinating. 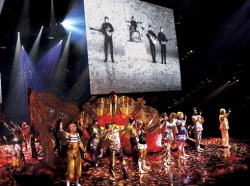 The whole of them, arms around each other, took victory bows in each of the four corners of the Mirage Theater's massive stage-in-the-round when the show was over. Paul, dressed in a black suit and white sneakers, looked thin and tired, maybe a little gaunt. This was not all due to flying in that day from London, but his recent marital difficulties were not the topic at hand. Motioning frantically to the fawning, screaming crowd, McCartney quieted us down. "We have to have applause for John and George," he said of his missing comrades, and the place went crazy. "To John and George!" Later, in this tricked-up private area for Apple family members, Paul took a corner seat on a white couch and introduced me to his two assistants — a pair of lovely young things. He was accompanied as well by an older-looking couple whom he identified as "family." What did he think about this momentous occasion? 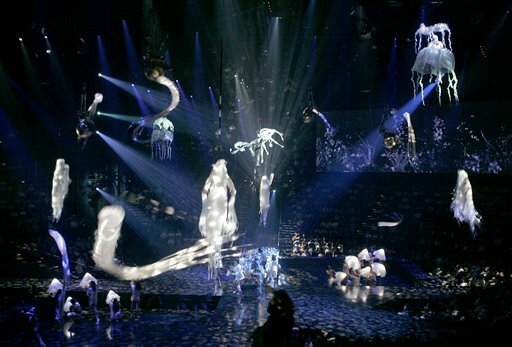 "Love" is such a triumph for the Beatles and Cirque du Soleil its genius can barely be described (although I will try to do it justice below). After the show, McCartney was overheard saying to Ringo Starr, a little startled by the magnitude of the evening, "We were a pretty f——ing great group, weren't we?" Then he cut himself short and said, in a typical McCartney revision, "We were a pretty great group!" Sitting on the white couch, about to receive Shankar, his wife, Ringo and a clutch of well-wishers, Paul seemed wiped out. After all, one of his heroes, Brian Wilson of the Beach Boys, had been in the audience along with actress Helen Mirren and husband, director Taylor Hackford , plus Edgar Winter, Sheila E. and Colin Hay (all touring with Ringo in his band), Electric Light Orchestra guru Jeff Lynne , songwriter Stephen Bishop, producer Russ Titelman, Barbara Orbison (widow of Roy), Little Steven van Zandt with wife, Maureen, actor Jason Patric, director Gus van Sant and, improbably, billionaire Ron Burkle. The only person missing? John Lennon's son with Ono, Sean. He'd been advertised but never showed. 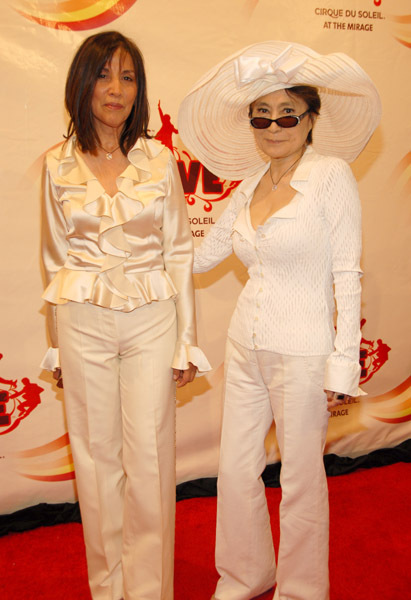 Ono arrived and walked the red carpet with her publicist. It was a bit reminiscent of last winter's Grammy Heroes dinner in New York when Sean was conspicuously absent. On Friday night there was no explanation, which was odd considering that Sean has been photographed out on the town in New York a lot this past month. So it was in front of all these people that McCartney — with Ono in the white hat and all the exhaustion of the public, embarrassing "revelations" about his soon-to-be ex-wife, Heather — watched "Love" in its entirety for the first time. 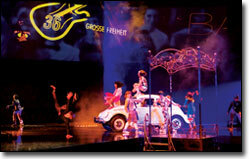 His voice and his songs constitute a good 75 percent of the show. It would have been an overwhelming experience for anyone. "I thought it was wonderful," he said, shaking his head, still taking it in. He'd kind of collapsed into the couch, eating vegetarian dishes that were only available in his section of the party. "It's the first time I've seen it all the way through. I have to see it again." 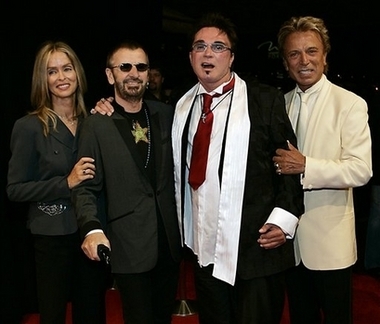 Within a second we were overcome by a wave of guests who wanted to find him, including Starr and wife, Barbara Bach. Across the way, maybe 20 feet at most, sitting on another couch, Ono plopped down next to Cynthia, the woman whose marriage she broke up some 40 years ago. "Thank you for coming to my party," Ono said incongruously. Cynthia just smiled for the photographers. 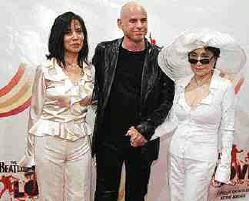 Later, I said to her, "I saw you talking to Yoko." She replied, "You saw her talking to me." She paused. "It's not like she gave me her phone number and said let's get together." The first Mrs. John Lennon shook her head in disbelief. "I think they call that a photo op."